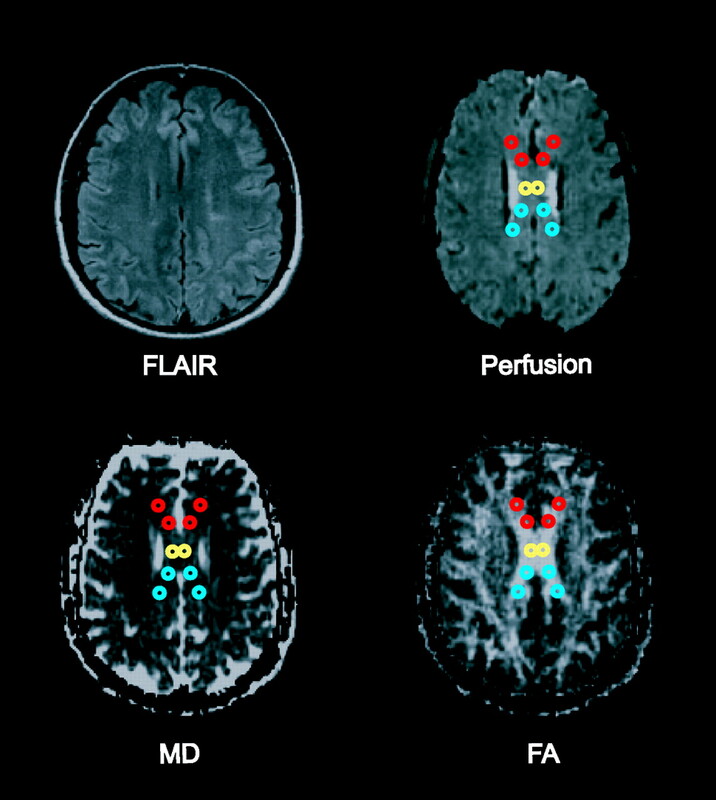 Fluid-attenuated inversion recovery image, perfusion image, MD map, and FA map showing placement of ROIs within the genu (red), central body (yellow), and splenium (blue) of the corpus callosum. Note:—MD, mean diffusivity; RRMS, relapsing-remitting multiple sclerosis; CBF, cerebral blood flow; CBV, cerebral blood volume; MTT, mean transit time. Statistical significance accepted at P < .05. Note:—FA, fractional anisotropy; RRMS, relapsing remitting multiple sclerosis; CBF, cerebral blood flow; CBV, cerebral blood volume; MTT, mean transit time. Statistical significance accepted at P < .05.